The Elemental Pizza card contains no value and is not eligible for Rewards until activated by a cashier. The card is only valid if obtained from participating Elemental Pizza locations. It is not valid if obtained from unauthorized sellers, including internet action sites. The card is non transferable and may only be used by the original owner. It cannot be redeemed for cash unless required by law. The value of the card will not be replaced if the card is lost, stolen, destroyed, altered or used without your permission. Use of this card constitutes acceptance of these terms and conditions. The Elemental Pizza card is for individual customers only. Points may not be earned for business. Points are earned for each dollar spent, excluding tax and tip, at all participating Elemental Pizza restaurants for most purchases. Certain restrictions apply. You must use your card once during the calendar year, Jan 1 to Dec 31, to retain earned points. If you do not earn any points in a calendar year your points will be forfeited. 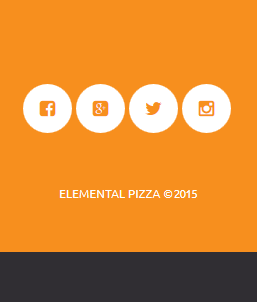 Earned Elemental Pizza rewards are not valid with any other offers, discounts and promotional certificates. Earned Elemental Pizza rewards are also not valid to use towards catering. Elemental Pizza reserves the right to add or withdraw participating restaurants, to make changes to the rules or rewards, audit or cancel your account, or terminate the program at any time without advance notice. Federal and State tax liabilities are the responsibility of the card holder. Applicants must be 18 years of age or older to enroll in the Elemental Pizza Program. Employees of Elemental Pizza are not eligible for enrollment.